Because, you see, at the end of the day, we might be able to handle 1 or 2 ways to decorate with an empty toilet paper roll or repurpose a tampon box (you never know!) or hope and pray for something new our kids will actually like to eat. But when we see those LARGE numbers it frankly makes us want to run the other way! So, we thought that maybe, just maybe, we weren’t the only ones getting a tad overwhelmed. 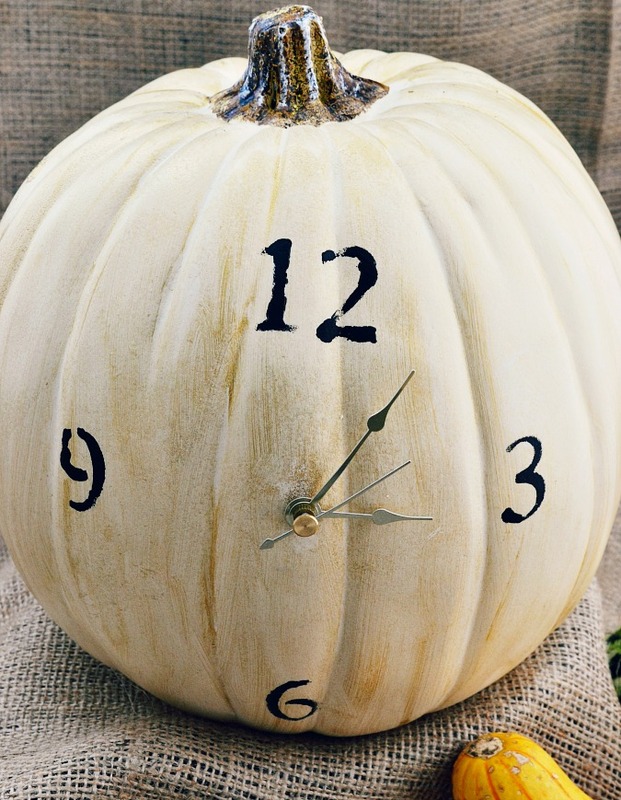 And while it was very tempting to put together the biggest collection of fun and fabulous pumpkin ideas that has ever been or will ever be created, we decided instead to just offer you 5. 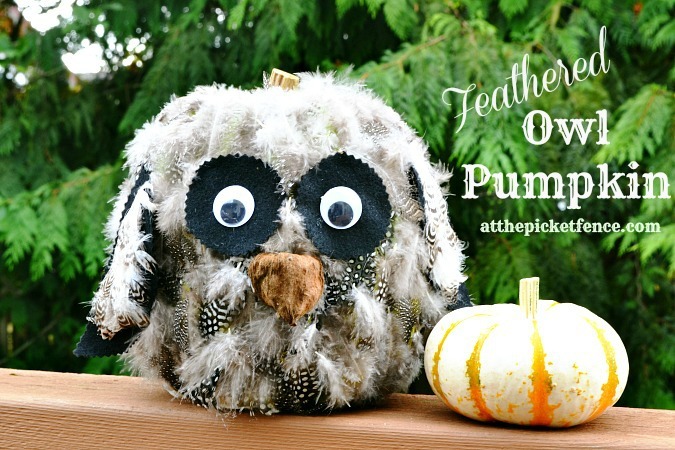 And this Feathered Owl Pumpkin. 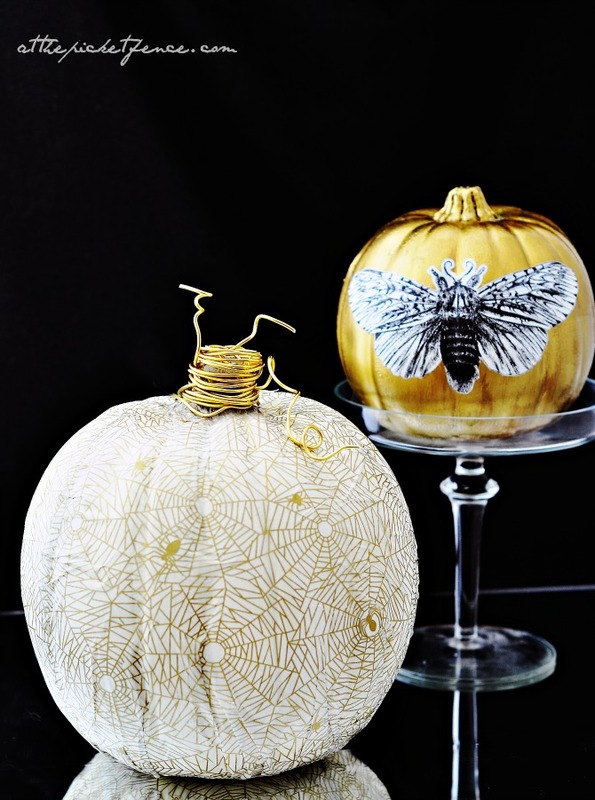 How about these White and Gold Decoupage Pumpkins. 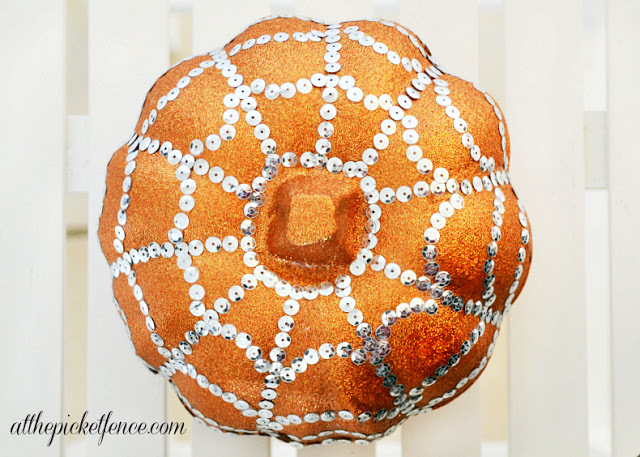 And last but not least a pumpkin for those of us needing a little more bling in our lives! So, what do you think? Is 5 a good number? Not too many to feel overwhelmed but not too few to feel…well..underwhelmed? Because, let’s face it, while we might feel that momentary thrill when we see the words “1,000 Things You Can Put in a Mason Jar”, somewhere between seeing those words and actually DOING even one out of the 1,000, real life tends to happen. Like homework and basketball practice and chin hairs and making dinners which you hope and pray everyone will eat without asking “how many more bites?”. So, we’re making a vow to you now that we will do our best to not contribute to the condition commonly known as “Pinterest anxiety”. 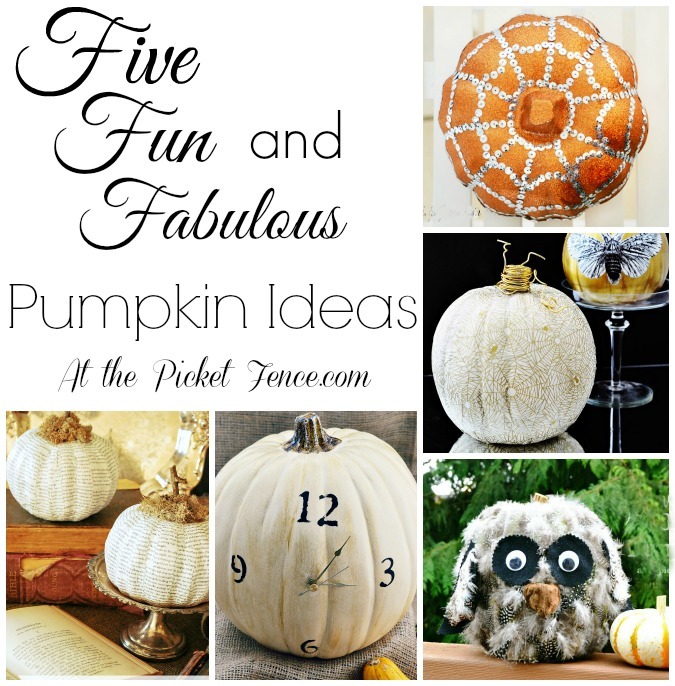 12 Comments on "Five Fun and Fabulous Pumpkin Ideas"
Actually I do run away when I see those “100 ways” Pinterest posts or Blog posts. It makes me feel someone got lazy and decided to just collect a bunch of others work and slap them together rather than come up some with quality content of their own. Smaller numbers are great because they could be something that actually struck you as a project you want to try. Love your white and gold pumpkins! Glam, but still perfect for fall! Aw, this was an incredibly good post. Taking the time and actual effort to make a very good article… but what can I say… I procrastinate a lot and don’t manage to get anything done. These are great! Especially the book covered paper. I just bought a couple of pumpkins to play around with and did something really simple with black permanent marker. 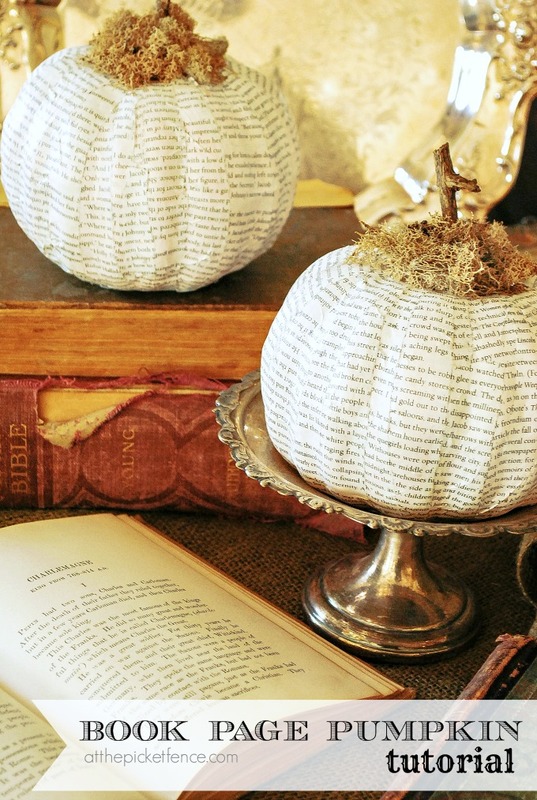 They were for outside, but these are so much fun, and I may have to try that book cover one for inside the house.